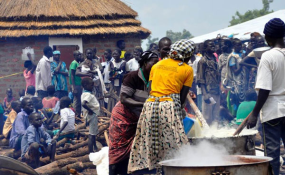 Refugees prepare a meal in Pagirinya Settlement in Adjumani District recently (file photo). Kampala — The government has accused international non-governmental organisations (NGOs) of hijacking donor funds raised from hosting the refugee solidarity summit in Kampala in June 2017. The country received a paltry $1.5 million (Shs5.6 billion) from only India and China, yet the summit had targeted to raise $2b (Shs7.5 trillion) to support 1.2 million refugees Uganda is hosting. While releasing a preliminary report on the refugee numbers verification exercise in Kampala yesterday, a visibly disappointed Disaster Preparedness and Refugees minister Hilary Onek said government spent more than Shs4b to organise the summit, but has in return received only pledges worth about $540m (Shs2 trillion). While Mr Onek was quick to criticise the international NGOs for hijacking the funds, he remained silent on African countries that pledged, but have not fulfilled them. Equatorial Guinea, Kenya, Gabon, and Somalia were some of the African countries that made pledges. It's not immediately clear whether they had fulfilled their pledges. But Mr Onek yesterday said apart from India and China, the rest of the countries gave the funds to their home NGOs working in Uganda. At the time of organising the summit, Uganda had reportedly proposed some infrastructure support to refugee hosting districts. However, Mr Onek yesterday said the roads had been destroyed by big trucks delivering food and other relief supplies. He said social services such as health centres and schools had been overstretched by the big number of refugees and government had intended to use the money pledged to boost such facilities. "Unfortunately, we got only $1.5m (Shs5.6 billion), which was put in the Treasury. For the rest of the money, the [international] NGOs working with refugees in Uganda lobbied their governments to channel to them the money. So the NGOs took all the money," Mr Onek said. He said Uganda has never seen any positive impact from hosting the refugee conference. He also said international NGOs that have hijacked the funds have not accounted for them to the government. "Recently, I wrote to the UNDP country representative; I asked where the money was because she was taking the lead in mobilising. She never answered me; now I'm getting responses from different countries that we have given this money to the NGOs who are working in your country." Mr Onek said government will compile the list of NGOs that received the money and summon them for accountability. Mr Joël Boutroue, the UNHCR country representative, said they will try to reorganise the funding systems so that they go through the line ministries to make the systems transparent and accountable. The individual NGOs are yet to respond to the accusations, but Mr Alun Mcdonald, the Advocacy and Communications manager at Save The Children, also the chairperson of International NGOs working with the refugees, said they have not received any official communication from Mr Onek. "However, on the issue of funding, it's not only the government that is running out of money. Even here at Save the Children, we are also struggling. A number of our programmes risk closing down if we don't get the funding we need by the end of the year," he said. Last week, 19 international NGOs working in the country issued a joint statement demanding that donors increase funds to cater for the refugees.